Rest assured with the incredibly durable, aluminum-magnesium alloy frame of BLUPOND Night Driving Glasses Women is built to last inevitable drops and dings. Go BLACK for Daytime Use OR set your sights to YELLOW with our TAC Semi Polarized Yellow-Tinted RALLY – transforming your vision to the most balanced yellow view + blue-light polarization. Working to protect your eyes from harmful Blue Light, we aim to reduce the contrast from bright blue & white glares and flashes for a more vivid nighttime drive. Shield your eyes from digital devices and bright headlights’ Blue Light emission, and from harsh environmental elements with our 100% UV400 RALLY. Rest assured with the incredibly durable, aluminum-magnesium alloy frame construction of your new Rally’s. Built to last amidst inevitable drops and dings. 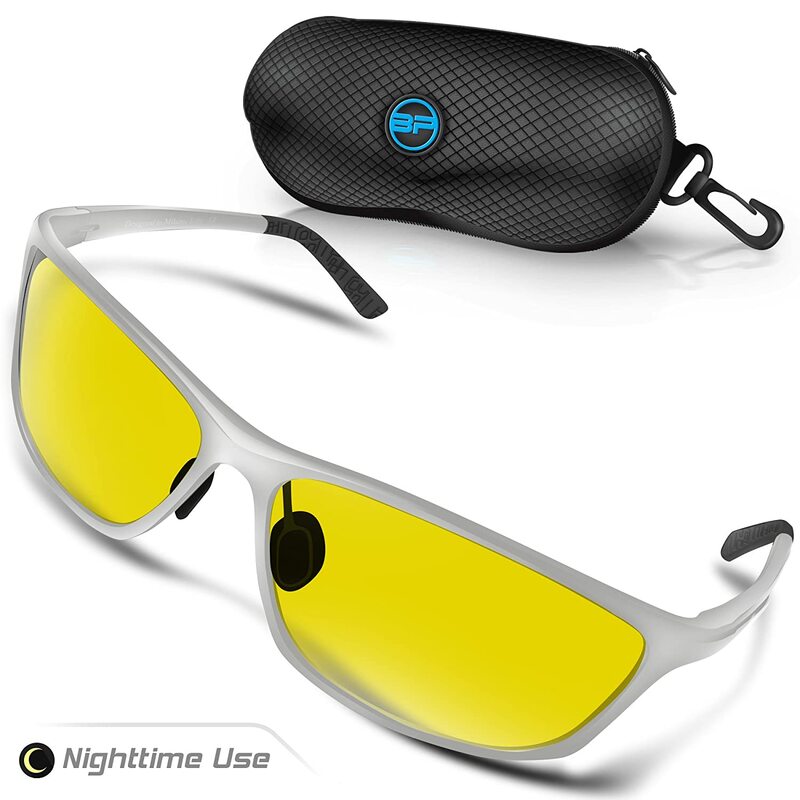 Intuitively designed full-frame form factor for heightened security and reliability + polycarbonate, shatterproof lenses, yellow-tinted for blue light neutralization OR blackout for maximum anti-glare polarization, does the work for you, letting you keep your eyes on the road at all times. The optimal form factor for maximum comfort and wearability, the Rallys were designed to be worn hours on end, effortlessly and with ease. Leave the stress and headaches behind, with our ultra-thin, super-light polarized lenses, complete with integrated nose pads and our rubberized support system for added security. Weighing in at just 30 grams, you’ll never want to take these babies off! Sleek and stylish, to be worn on or off the road, our timeless, classic Italian design exudes ingenuity and innovation. A fashion statement fit for both men and women, no matter the occasion. Take your race car driving, sports, and outdoor adventuring to new heights in any of our 3 colorways: Silver or Black, with Nighttime Yellow-tinted lenses, or Black with Daytime Blackout lenses. In addition to your new RALLY by BLUPOND, you will receive a Complementary Accessory Set, complete with our EVA protective sports case, Screwdriver for minor adjustments, Sunglasses pouch, Microfiber cleaning cloth, Glasses clip for convenient car storage, and Gift box. The total package to keep you active and ready anywhere you go. I like it because it is light weight.